Burr Elm veneer with inlaid marquetry lid. Satin finish, turned brass feet. 1 tune 18, 22 or 36 note clockwork wound. A selection of tunes & movement sizes are available to choose from when ordering below. 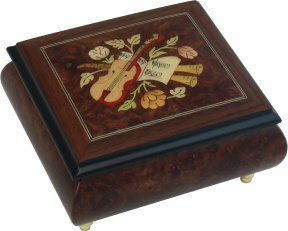 This beautifully made petite music box has a musical theme inlay design set into the lid. 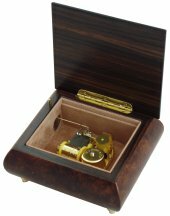 Burr elm wood veneers with palisander edging makes this music box a lovely gift idea. 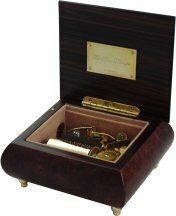 Open the lid to hear the music box play and see the movement. 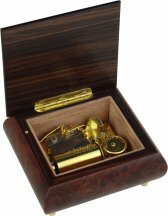 Choose from 18, 22 or luxury 36 note movement sizes. For more information on the musical movements used, please click here.